With #2 on the way, it's time to bust out the decaf again. Following the suggestion of Brett H and a few others on the forum, I purchased some Brazil Daterra Estate Opus and some Colombian water-processed decaf from BeanGreen. As usually, everything arrived exceedingly quickly (although I reckon Lacehim has better posties - we're only about 30k away from each other and his beans always seem to arrive the same day they're shipped. Mine always arrive the day after) and Brendan had slipped a sample of something extra in, which I'll be keen to try soon. I did 200g of the Opus and 150g of the Decaf. Roast times were fast with the low volume, only 13 minutes in total. As per the suggestions on the board, I let these beans get a little darker and they were pulled at the start of second crack. My better half is thrilled with the result. She hated the DiBella decaf I grabbed while I was in Brisbane the previous weekend for the cupping, but loves this despite the slightly bitter taste. I've tried it - it's definitely somewhat bitter and lacks the full range of flavour I love from my espresso.... but that said, I wouldn't complain very hard if someone served that drink to me. It's really not bad at all. Has anyone tried roasting up the Opus as a SO? I was surprised at how evenly it came out. Even being a little distracted and having trouble hearing the beans over the wind it turned out ok.
Nice roast mate. I nearly burned mine to death the first time! lol. My latest of this I went lighter than usual and pulled I right on the second crack. It's just wonderful either way to be honest. Good looking roast mate! It's a shame I can't add anything to this thread other than nice looking roast just that I have never had a need to roast decaf, guess I shouldn't complain, I drink what I like and I like what I drink. Hi Jasmine and welcome. That's exactly what we all did. Sadly my supplier has changed and I'm now back to Mexican Decaf which I roast to the first snaps of second crack. It's not as good as the above blend but it's cheaper and I reckon less caffeinated. I don't know this for sure... but I've less sleepless nights currently than I remember having with the Opus One! 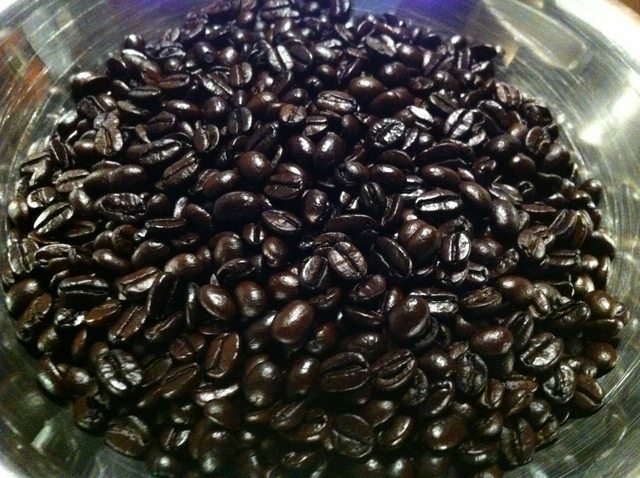 Decaf is so tricky to roast. Roast light-medium and it can taste "grassy." I think that the dark roast is the only way to get a decent result. I used to think decaf had to be roasted dark as well. My first few roasts weren't as dark as the beans in that photo above that look like they've been washed with a bottle of Castrol (no offense intended, each to their own), but they were definitely on the edge of 2nd crack. It was a SW FTO blend called Cascadia and was drinkable, but only with milk and I ended up blending it with other beans to make a 'half-caf' blend. I wasn't really interested in drinking decaf, but I wanted to try some both to learn how to roast it and see what it tasted like. The Cascadia was disappointing overall and at that stage simply affirmed what I thought about decaf. However recently I bought a Colombian decaf and I've had to adjust my thinking as it has blown me away with how good it is. It's fairly versatile although I haven't tried it as a filter coffee (yet). I'm using it in a half-caf blend with a Colombian Pescador which is really nice, but I have to admit that it's actually at its best as an espresso. I had no idea a decaf could be this good. It is sweet with a nice mouthfeel and is just really enjoyable. It's also a Swiss Water process, but I only bought 1kg so I haven't been able to trace the origin. I'll ask the supplier though as I'm sure I'll end up getting some more. There are some really nice SO decafs out there now apparently, I know Sweet Maria's and Coffee Shrub have made a real effort to source quality decafs, but I think things are a bit more fickle in this part of the world. I'm not surprised that the Swiss Water decaf was great. Most people don't realise the sheer size of the Swiss Water operation in Canada, nor it's exceptional commitment to quality. Picture a couple of MCG's. Their sourcing and R&D is way beyond anything else in the industry except perhaps Illy, Nestle and Lavazza. The qualities of their raw coffees surpass the majority of what we see in the green bean market....they are so far ahead of the game. It's also part of the reason the product costs so much, putting aside the decaf process......it's actually good grade coffee. Don't expect to identify farms or estates because that's their exclusive IP.....why would they ever disclose it - only to risk the security of supply. Where they offer blends, they are transparent on blend composition in terms of origins and varietals.......which is all you need to know. In terms of roasting decaf, it's always been my #1 favourite coffee to roast. I roast it 3 or 4 days a week as we sells heaps of decaf every day. We rarely have decaf for 2days which keeps it super fresh and limits the nasty visuals of oiled up coffees. By far it's the easiest bean to control as it transitions through the 1st crack zone with absolute linear ROR. There is no other coffee like it in that regard which means you are not juggling burner and air settings like crazy to compensate for wild swings in endo and exothermic reactions. It does not crash like a hard Kenyan AA or race like a soft natural.......it runs the most predictable and perfect path imaginable. When I look at the roast curves for Decaf it's like art....an object of beauty.......straight from the textbook of how a roast cycle should play out. If only all coffees behaved like decaf it would make my job so much easier. There are not a lot of market choices for chemical free decafs..there are basically only 2 big plants in the world.....Swiss Water in Canada and Mountain Water in Mexico. Both produce a broad range of water process decals in just about every origin. In terms of Maria's or Shrub doing something special in terms of decaf sourcing......nope - they are just holding a larger range of choices than traditional brokers because they are servicing a different market. Brokers supply roasters, Maria's and Shrub feed the home roasting market. Coffee companies just want a great tasting reliable and consistent decaf.......they just want a choice of one(1) because their own customers view decaf as nothing special......or at worst decaf is considered a nuisance so there is no zero interest in having a plethora of decaf options for cafes. Home roasters are different.......they want to experiment and learn......hence abundance of choices. It's neither better or worse that whats offered in Australia & New Zealand. As a side note I am not a fan of their roasting philosophies for decaf, or some of their other coffees. With Decaf, the differentiating factors in the finished product (roasted) come down to the skill of the roaster and the inherent freshness. Brett you should not discount the skill you have developed because you are in fact a genius being able to roast DCF and MM. Many roasters I know are all at sea with decaf...........mostly burning the bejesus out of it......complaining that it's too hard or difficult to control using their standard sausage factory 2 or 3 step manual profiles they use for their non-decaf. Ironically, it's these same roasters that refuse to modernize with computers and monitoring tools to understand what is actually going on during the roast cycle. MM takes considerable skill and for some roaster's it's all too hard. I'd say that MM is perhaps the most difficult bean to roast followed closely by Kenyan AA's. Don't expect to identify farms or estates because that's their exclusive IP.....why would they ever disclose it - only to risk the security of supply. In terms of Maria's or Shrub doing something special in terms of decaf sourcing......nope - they are just holding a larger range of choices than traditional brokers. MC. I just have a couple of comments and questions. Firstly, I was led to believe that Swiss Water green coffee bags have a code on them that can be used to get more info about the origin on the Swiss Water website. I can't for the life of me remember where I read this and as I only buy 1-2kg at a time for home roasting I'm not in a position to investigate myself. Is this not something that can be done? Also I agree that Sweet Maria's aren't doing anything special with decaf, it's just that they seem to have a greater range and variation than what I've seen in NZ (not sure about Australia). Finally can you elaborate on what you don't like about Sweet Maria's and/or Coffee Shrub's roasting philosophy? 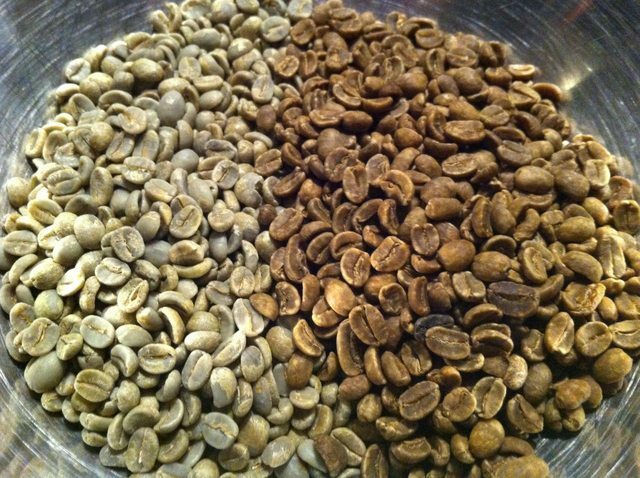 I've read all the roasting approach notes on Coffee Shrub and have applied a few similar principles to my roasts. Obviously they've been adapted to suit a Behmor, but I found a lot of the info useful as a starting point. It's always good to hear other points of view so while I understand you're very busy anything you have to add would be much appreciated as always. Yes Leroy the origin will already appear on the bag, e.g. Colombia SWP Decaf is from origin Colombia, etc. For blends, they print a small tag on the bag showing the percentage of each origin in the blend which is very handy when roasting for the first time. So that satisfies the origin question. However, if I'm not mistaken, the question about origin you are perhaps really trying to ask is that of provenance, e.g. region/department/section and farm or estate identification, etc. I have not attempted to identify such information from the SWP Decafs I purchase because I assumed already that it's their IP. But, I would very much doubt they would reveal such information on some of their more popular origins such as Colombia as it then exposes and risks all the hard work undertaken by their green bean sourcing and the R&D teams. You must remember here they are large buyers of direct trade that spend upwards of a million $$ each year just in the efforts to source and evaluate coffee. This is before they even start the production process and sell their products. They, like Illy, Nestle, Starbucks and many large companies over 250+ tons per year have teams of people out hunting, negotiating and lab testing lots and samples - they don't source via brokers like the majority of companies around the world. This investment of cost and effort needs protection. Revealing the farm information is like chopping off your only market advantage. But of course they might do this for smaller lots from less popular origins or where they have sourced something as a one-off. Competitors (and that includes everyone involved in coffee) swoop in and attempt to steal the next crop from under your nose. It's happens all day every day.....even when you use local brokers. Case in point, 3 weeks ago I had some very nice and expensive coffee (read.... I really, really wanted that coffee more than anything) contracted on the phone with the broker. By the time the call was finished, one of the broker's associates had already booked the coffee to another roaster and I missed out. In terms of roasting styles and philosophies, everyone has their own approach. Mine is different to Maria's & Shrub and that's my unique point of difference. I tend to think their roast depth is too dark. Aww shucks... blush. My only genius is knowing my limitations and roasting in batches small enough to not cause financial angst if I get it wrong! Also, because I gift roasted beans but refuse to sell any means that I'm in no position to comment realistically on any level, other than loose observations/anecdotal! Thanks for your response. I agree, and tend not to take most of my roasts to that sort of depth and level of development. Although it's horses for courses and I do occasionally take a roast to the edge of 2C if it's a bean that will mostly be used with milk drinks either on its own or in a blend. I love a bright, fruity, sweet black coffee, but it's often not the best when combined with milk. what's the story with decaf?